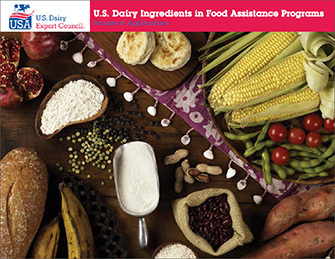 The information and recipes provided in this booklet illustrate the functionality, nutrition and versatility of U.S. dairy ingredients in food aid applications. The recipes can be tailored to individual tastes throughout the world. The formulations presented in this publication are provided as a starting point for developmental purposes. Product developers are encouraged to modify the formulas to meet manufacturing and finished product specification needs. Check local legislation for ingredient usage, product standards and labeling.